Eliminates unpleasant odors from towels, blankets and bedding. Works well on any machine washable item. Remove cap from the small, graduated part. Squeeze large part of the bottle to measure solution. Add L.O.E., at the rate outlined below, to the presoak or auto-soak cycle, or directly with the detergent. 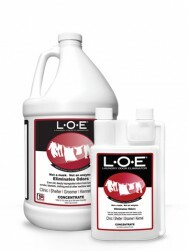 You can also pre-treat heavily contaminated items with L.O.E. Simply add 1/2oz to water and soak prior to washing. When washing pre-treated items, simply follow the directions above. L.O.E. is a laundry additive, not a detergent. 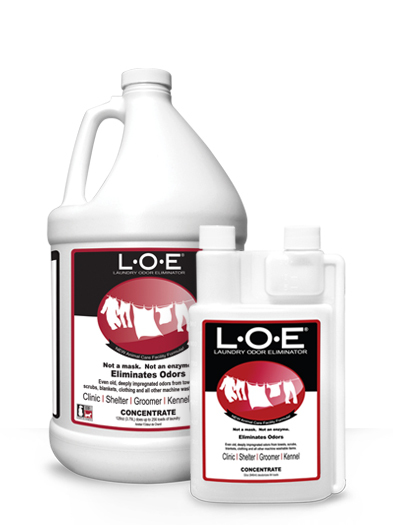 For optimal performance, use every time you machine wash clothes, towels, blankets or scrubs that require odor removal. L.O.E. works great for odors caused by urine, feces, emesis, and other organic odors. L.O.E. is safe for use with detergents, fabric softeners, disinfectants and other laundry additives. Effectiveness is reduced by chlorine bleach.